$1,099,000 Heart of Vaughan! Family Home on Wide Lot! Welcome to 4 Granite Street, a Well-Built, Well-Maintained Family Home with a Spacious Layout and Basement Kitchen for Entertaining, Possible In-Law/Nanny Suite, or Income Unit! This Home is Situated on a Spacious Lot Ideal for Kids, Pets, a Pool or a Large Garden! 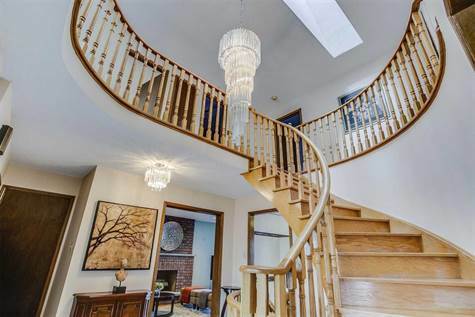 This Bright, Sun-Filled Home Features a Stunning Entry with Gorgeous Skylight and Dramatic Twisting Staircase! Gleaming Hardwood Floors and Spacious Principal Rooms Through-Out! The Large Main Floor Boasts Separate Formal Living and Dining Rooms, a Family Room with Fireplace and Walk-Out to the Garden, and a Family Sized Kitchen with Breakfast Room and Walk-Out to a Gorgeous Patio and the Huge Backyard! 4 Spacious Bedrooms are Situated on the Second Floor, Where the Luxury Continues. The Huge Master Bedroom Retreat Features a Double Closet and 5 Piece Ensuite Spa-Like Bathroom! The 2nd and 3rd Bedrooms Each Feature a Walk-In Closet! The Finished Basement Features a Separate Entry and Includes a Second Kitchen with Double Sink and Ceramic Flooring, a Large Recreation Room with Wet Bar and Fireplace, and a Large Cold Room/Cantina. Great Location! Walk to Stores, Transit and Excellent Schools!